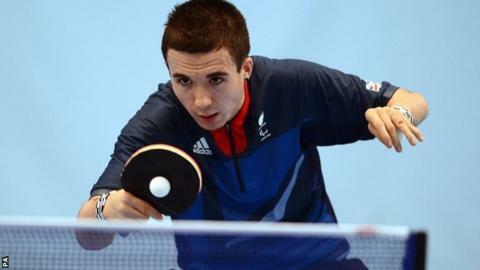 Britain's Will Bayley had to settle for silver after losing to Germany's Jochen Wollmert in the class 7 final. Bayley went down 3-1 and collapsed on the floor in tears at the end before being helped up by Wollmert. The 24-year-old Bayley, who came into the event ranked second in the world, lost 11-8 4-11 11-5 11-4. "He is a great champion but I'm disappointed with the way I played. I didn't feel I played my best," Bayley told BBC Sport. Bayley, who was born with a condition called arthrogryposis, which affects his muscle growth, had chased the game from the start but gave himself hope when some smart play saw him level the match at one set apiece. However the 48-year-old German, who won his first Paralympic medal in Barcelona in 1992, took control after that to claim a third singles gold after wins in Beijing and Sydney. "A Paralympic silver medal in table tennis is not an easy thing to achieve and I am proud of myself for that," added Bayley. "My coach said I should be proud of myself for working so hard six hours a day for the past six years and I have got to enjoy the moment because it doesn't happen often. "We have a great chance of medalling in the team competition as well, and that would be a great achievement." Bayley, who is a graduate of the Brit School for Performing Arts in Croydon, is already looking to another big-stage appearance in Rio in four years time. "I've come on a lot in the past four years. In Beijing I didn't make it out of my group and here I have won a silver medal," he said. "I am still young and I feel like I am good enough to win Paralympic gold but today just wasn't the day. But I've trained as hard as anybody else in the world and that is why losing is so hard to take."